The Whirlpool Galaxy, also known as M51, is a spiral galaxy about 23 million light-years from Earth. Its interactions with the yellowish dwarf galaxy NGC 5195 are of interest to astronomers because the galaxies are near enough to Earth to be well-studied. Decades ago astronomers could not tell if these two galaxies were just passing each other but radio astronomy has supplied astronomers with important data outlining their interactions. Using this data, astronomers have simulated the interaction. NGC 5195 came from behind and then passed through the main disk of M51 about 500 to 600 million years ago. The dwarf galaxy crossed the disk again between 50 and 100 million years ago and is now slightly behind M51. These interactions appear to have intensified the spiral arms that are the dominant characteristic of the Whirlpool Galaxy. Astronomers are able to learn about objects unimaginably far away from Earth using telescopes that sense all wavelengths on the electromagnetic spectrum. Imagine what Galileo would do if he could see the images and data astronomers have available to them now. The study of the universe is called cosmology. Cosmologists study the structure and changes in the present universe. The universe contains all of the star systems, galaxies, gas and dust, plus all the matter and energy that exists now, that existed in the past, and that will exist in the future. The universe includes all of space and time. How does the Universe create complexity? What are the believed conditions needed for life to exist anywhere in the universe? What makes humans different from other forms of life on earth? What did the ancient Greeks recognize as the universe? In their model, the universe contained Earth at the center, the Sun, the Moon, five planets, and a sphere to which all the stars were attached. This idea held for many centuries until Galileo's telescope helped allow people to realize that Earth is not the center of the universe. They also found out that there are many more stars than were visible to the naked eye. All of those stars were in the Milky Way Galaxy. In the early 20th century, an astronomer named Edwin Hubble discovered that what scientists called the Andromeda Nebula was actually over 2 million light years away, many times farther than the farthest distances that had ever been measured. Hubble realized that many of the objects that astronomers called nebulas were not actually clouds of gas, but were collections of millions or billions of stars that we now call galaxies. Hubble showed that the universe was much larger than our own galaxy. Today, we know that the universe contains about a hundred billion galaxies, about the same number of galaxies as there are stars in the Milky Way Galaxy. After discovering that there are galaxies beyond the Milky Way, Edwin Hubble went on to measure the distance to hundreds of other galaxies. His data would eventually show how the universe is changing, and would even yield clues as to how the universe formed. Today we know know that the universe in nearly 14 billion years old. If you look at a star through a prism, you will see a spectrum, or a range of colors through the rainbow. The spectrum will have specific dark bands where elements in the star absorb light of certain energies. By examining the arrangement of these dark absorption lines, astronomers can determine the composition of elements that make up a distant star. In fact, the element helium was first discovered in our Sun, not on Earth, by analyzing the absorption lines in the spectrum of the Sun. While studying the spectrum of light from distant galaxies, astronomers noticed something strange. The dark lines in the spectrum were in the patterns they expected, but they were shifted toward the red end of the spectrum, as shown in Figure below. This shift of absorption bands toward the red end of the spectrum is known as redshift. Redshift occurs when the light source is moving away from the observer or when the space between the observer and the source is stretched. What does it mean that stars and galaxies are redshifted? When astronomers see redshift in the light from a galaxy, they know that the galaxy is moving away from Earth. What astronomers are noticing is that all the galaxies have a redshift, strongly indicating that all galaxies are moving away from each other causing the Universe to expand. Redshift can occur with other types of waves too, called the Doppler Effect. An analogy to redshift is the noise a siren makes as it passes you. You may have noticed that an ambulance seems to lower the pitch of its siren after it passes you. The sound waves shift towards a lower pitch when the ambulance speeds away from you. Though redshift involves light instead of sound, a similar principle operates in both situations. Click here to view an animation of Doppler Effect. Edwin Hubble combined his measurements of the distances to galaxies with other astronomers’ measurements of redshift. From this data, he noticed a relationship, which is now called Hubble’s Law. The law states that the farther away a galaxy is, the faster it is moving away from us. What this leads to is the hypothesis that the universe is expanding. For an animation demonstrating the expanding universe, click here. Before Hubble, most astronomers thought that the universe didn’t change. But if the universe is expanding, what does that say about where it was in the past? If the universe is expanding, the next logical thought is that in the past it had to have been smaller. The Big Bang theory is the most widely accepted cosmological explanation of how the universe formed. If we start at the present and go back into the past, the universe is contracting, getting smaller and smaller. What is the end result of a contracting universe? According to the Big Bang theory, the universe began about 13.7 billion years ago. Everything that is now in the universe was squeezed into a very small volume. Imagine all of the known universe in a single, hot, chaotic mass. An enormous explosion — a big bang — caused the universe to start expanding rapidly. All the matter and energy in the universe, and even space itself, came out of this explosion. What came before the Big Bang? There is no way for scientists to know since there is no remaining evidence. In the first few moments after the Big Bang, the universe was unimaginably hot and dense. As the universe expanded, it became less dense and began to cool. After only a few seconds, protons, neutrons, and electrons could form. After a few minutes, those subatomic particles came together to create hydrogen. Energy in the universe was great enough to initiate nuclear fusion and hydrogen nuclei were fused into helium nuclei. The first neutral atoms that included electrons did not form until about 380,000 years later. The matter in the early universe was not smoothly distributed across space. Dense clumps of matter held close together by gravity were spread around. Eventually, these clumps formed countless trillions of stars, billions of galaxies, and other structures that now form most of the visible mass of the universe. If you look at an image of galaxies at the far edge of what we can see, you are looking at great distances. But you are also looking across a different type of distance. What do those far away galaxies represent? Because it takes so long for light from so far away to reach us, you are also looking back in time. The Big Bang theory is still the best scientific model we have for explaining the formation of the universe and many lines of evidence support it. However, recent discoveries continue to shake up our understanding of the universe. Astronomers and other scientists are now wrestling with some unanswered questions about what the universe is made of and why it is expanding. A lot of what cosmologists do is create mathematical models and computer simulations to account for these unknown phenomena, such as dark energy and dark matter. The things we observe in space are objects that emit some type of electromagnetic radiation. However, scientists think that matter that emits light makes up only a small part of the matter in the universe. The rest of the matter, about 80 percent, is dark matter. Dark matter emits no electromagnetic radiation so we can’t observe it directly. However, astronomers know that dark matter exists because its gravity affects the motion of objects around it. When astronomers measure how spiral galaxies rotate, they find that the outside edges of a galaxy rotate at the same speed as parts closer to the center. This can only be explained if there is a lot more matter in the galaxy than they can see. Gravitational lensing occurs when light is bent from a very distant bright source around a super-massive object. To explain strong gravitational lensing, more matter than is observed must be present. With so little to go on, astronomers don’t really know much about the nature of dark matter. One possibility is that it could just be ordinary matter that does not emit radiation in objects such as black holes, neutron stars, and brown dwarfs, objects larger than Jupiter but smaller than the smallest stars. But astronomers cannot find enough of these types of objects, which they have named MACHOS (massive astrophysical compact halo object), to account for all the dark matter, so they are thought to be only a small part of the total. Another possibility is that the dark matter is thought to be much different from the ordinary matter we see. Some appear to be particles that have gravity, but don’t otherwise appear to interact with other particles. Scientists call these theoretical particles WIMPs, which stands for Weakly Interactive Massive Particles. Most scientists who study dark matter think that the dark matter in the universe is a combination of MACHOS and some type of exotic matter such as WIMPs. Researching dark matter is an active area of scientific research, and astronomers’ knowledge about dark matter is changing rapidly. Astronomers who study the expansion of the universe are interested in knowing the rate of that expansion. Is the rate fast enough to overcome the attractive pull of gravity? If yes, then the universe will expand forever, although the expansion will slow down over time. If no, then the universe would someday start to contract, and eventually get squeezed together in a big crunch, the opposite of the Big Bang. Recently astronomers have made a discovery that answers that question: the rate at which the universe is expanding is actually increasing. In other words, the universe is expanding faster now than ever before, and in the future it will expand even faster. So now astronomers think that the universe will keep expanding forever. But it also proposes a perplexing new question: What is causing the expansion of the universe to accelerate? One possible hypothesis involves a new, hypothetical form of energy called dark energy. Some scientists think that dark energy makes up as much as 72 percent of the total energy content of the universe. Although constellations have stars that usually only appear to be close together, stars may be found in the same portion of space. Stars that are grouped closely together are called star systems. Larger groups of hundreds or thousands of stars are called star clusters. The image shown here is a famous star cluster classed M45, also known as Pleides, which can be seen with the naked autumn sky. Although the star humans know best is a single star, many stars—in fact, more than half of the bright stars in our galaxy—are star systems. A system of two stars orbiting each other is a binary star. A system with more than two stars orbiting each other is a multiple star system. The stars in a binary or multiple star system are often so close together that they appear as one and only through a telescope can the pair be distinguished. Star clusters are divided into two main types, open clusters and globular clusters. Open clusters are groups of up to a few thousand stars that are loosely held together by gravity. Pleiades is an open cluster that is also called the Seven Sisters. Open clusters tend to be blue in color and often contain glowing gas and dust. Why do you think that open clusters have these features? Open clusters are made of young stars that formed from the same nebula. The stars may eventually be pulled apart by gravitational attraction to other objects. Globular clusters are groups of tens to hundreds of thousands of stars held tightly together by gravity. 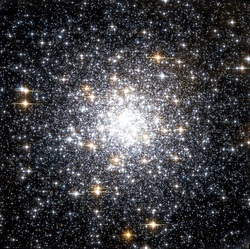 Figure below shows an example of a globular cluster. Globular clusters have a definite, spherical shape and contain mostly reddish stars. The stars are closer together, closer to the center of the cluster. Globular clusters don’t have much dust in them — the dust has already formed into stars. To view more amazing images taken by the Hubble telescope, click here. If you would like to download free eBooks of Hubble imagery, click here. Galaxies are the biggest groups of stars and can contain anywhere from a few million stars to many billions of stars. Every star that is visible in the night sky is part of the Milky Way Galaxy. To the naked eye the closest major galaxy, the Andromeda Galaxy, looks like only a dim, fuzzy spot but that fuzzy spot contains one trillion stars. Spiral galaxies spin, so they appear as a rotating disk of stars and dust, with a bulge in the middle, like the Sombrero Galaxy. Several arms spiral outward in the Pinwheel Galaxy and are appropriately called spiral arms. Spiral galaxies have lots of gas and dust and lots of young stars. Other galaxies are egg-shaped and called elliptical galaxy. The smallest elliptical galaxies are as small as some globular clusters. Giant elliptical galaxies, on the other hand, can contain over a trillion stars. Elliptical galaxies are reddish to yellowish in color because they contain mostly old stars. Most elliptical galaxies contain very little gas and dust because they had already formed. However, some elliptical galaxies contain lots of dust. Why might some elliptical galaxies contain dust? Galaxies that are not clearly elliptical galaxies or spiral galaxies are irregular galaxies. Most irregular galaxies were once spiral or elliptical galaxies that were then deformed either by gravitational attraction to a larger galaxy or by a collision with another galaxy. Look back at the picture of the spiral galaxy, Andromeda. Next to our closest galaxy neighbor are two dwarf elliptical galaxies that are companions to the Andromeda Galaxy. One is a bright sphere to the left of center, and the other is a long ellipse below and to the right of center. Dwarf galaxies are often found near larger galaxies. They sometimes collide with and merge into their larger neighbors. On January 5, NASA released an image of the Andromeda galaxy, our closest galactic neighbour, captured by the NASA/ESA Hubble Space Telescope. The full image is made up of 411 Hubble images, takes you through a 100 million stars and travels over more than 40,000 light years. Well, a section of it anyway. On a dark, clear night, you will see a milky band of light stretching across the sky. This band is the disk of a galaxy, the Milky Way Galaxy, is our galaxy and is made of millions of stars along with a lot of gas and dust. Although it is difficult to know what the shape of the Milky Way Galaxy is because we are inside of it, astronomers have identified it as a typical spiral galaxy containing about 100 billion to 400 billion stars. Like other spiral galaxies, our galaxy has a disk, a central bulge, and spiral arms. The disk is about 100,000 light-years across and 3,000 light-years thick. Most of the Galaxy’s gas, dust, young stars, and open clusters are in the disk. What data and evidence do astronomers find that lets them know that the Milky Way is a spiral galaxy? The shape of the galaxy as we see it. The velocities of stars and gas in the galaxy show a rotational motion. The gases, color, and dust are typical of spiral galaxies. The central bulge is about 12,000 to 16,000 light-years wide and 6,000 to 10,000 light-years thick. The central bulge contains mostly older stars and globular clusters. Some recent evidence suggests the bulge might not be spherical, but is instead shaped like a bar. The bar might be as long as 27,000 light-years long. The disk and bulge are surrounded by a faint, spherical halo, which also includes old stars and globular clusters. Astronomers have discovered that there is a gigantic black hole at the center of the galaxy. The Milky Way Galaxy is a significant place. Our solar system, including the Sun, Earth, and all the other planets, is within one of the spiral arms in the disk of the Milky Way Galaxy. Most of the stars we see in the sky are relatively nearby stars that are also in this spiral arm. Earth is about 26,000 light-years from the center of the galaxy, a little more than halfway out from the center of the galaxy to the edge. Just as Earth orbits the Sun, the Sun and solar system orbit the center of the Galaxy. One orbit of the solar system takes about 225 to 250 million years. The solar system has orbited 20 to 25 times since it formed 4.6 billion years ago. Astronomers have recently found that at the center of the Milky Way, and most other galaxies, is a supermassive black hole, though a black hole cannot be seen. The Sun is Earth’s major source of energy, yet the planet only receives a small portion of its energy and the Sun is just an ordinary star. Many stars produce much more energy than the Sun. The energy source for all stars is nuclear fusion. Stars are made mostly of hydrogen and helium, which are packed so densely in a star that in the star’s center the pressure is great enough to initiate nuclear fusion reactions. In a nuclear fusion reaction, the nuclei of two atoms combine to create a new atom. Most commonly, in the core of a star, two hydrogen atoms fuse to become a helium atom. Although nuclear fusion reactions require a lot of energy to get started, once they are going they produce enormous amounts of energy. In a star, the energy from fusion reactions in the core pushes outward to balance the inward pull of gravity. This energy moves outward through the layers of the star until it finally reaches the star’s outer surface. The outer layer of the star glows brightly, sending the energy out into space as electromagnetic radiation, including visible light, heat, ultraviolet light, and radio waves. In particle accelerators, subatomic particles are propelled until they have attained almost the same amount of energy as found in the core of a star. When these particles collide head-on, new particles are created. This process simulates the nuclear fusion that takes place in the cores of stars. The process also simulates the conditions that allowed for the first helium atom to be produced from the collision of two hydrogen atoms in the first few minutes of the universe. Think about how the color of a piece of metal changes with temperature. A coil of an electric stove will start out black but with added heat will start to glow a dull red. With more heat the coil turns a brighter red, then orange. At extremely high temperatures the coil will turn yellow-white, or even blue-white (it’s hard to imagine a stove coil getting that hot). A star’s color is also determined by the temperature of the star’s surface. Relatively cool stars are red, warmer stars are orange or yellow, and extremely hot stars are blue or blue-white. Color is the most common way to classify stars. Table below shows the classification system. The class of a star is given by a letter. Each letter corresponds to a color, and also to a range of temperatures. Note that these letters don’t match the color names; they are left over from an older system that is no longer used. For most stars, surface temperature is also related to size. Bigger stars produce more energy, so their surfaces are hotter. These stars tend toward bluish white. Smaller stars produce less energy. Their surfaces are less hot and so they tend to be yellowish. As NASA notes, stars have a life cycle that is expressed similarly to the life cycle of a living creature: they are born, grow, change over time, and eventually die. Most stars change in size, color, and class at least once in their lifetime. What astronomers know about the life cycles of stars is because of data gathered from visual, radio, and X-ray telescopes. To learn more about star formation from the European Space Agency (ESA), click here. For most of a star’s life, nuclear fusion in the core produces helium from hydrogen. A star in this stage is a main sequence star. This term comes from the Hertzsprung-Russell diagram shown here. For stars on the main sequence, temperature is directly related to brightness. A star is on the main sequence as long as it is able to balance the inward force of gravity with the outward force of nuclear fusion in its core. The more massive a star, the more it must burn hydrogen fuel to prevent gravitational collapse. Because they burn more fuel, more massive stars have higher temperatures. Massive stars also run out of hydrogen sooner than smaller stars do. Our Sun has been a main sequence star for about 5 billion years and will continue on the main sequence for about 5 billion more years. Very large stars may be on the main sequence for only 10 million years. Very small stars may last tens to hundreds of billions of years. As a star begins to use up its hydrogen, it fuses helium atoms together into heavier atoms such as carbon. A blue giant star has exhausted its hydrogen fuel and is a transitional phase. When the light elements are mostly used up the star can no longer resist gravity and it starts to collapse inward. The outer layers of the star grow outward and cool. The larger, cooler star turns red in color and so is called a red giant. Eventually, a red giant burns up all of the helium in its core. What happens next depends on how massive the star is. A typical star, such as the Sun, stops fusion completely. Gravitational collapse shrinks the star's core to a white, glowing object about the size of Earth, called a white dwarf. A white dwarf will ultimately fade out. A star that runs out of helium will end its life much more dramatically. When very massive stars leave the main sequence, they become red supergiants. Unlike a red giant, when all the helium in a red supergiant is gone, fusion continues. Lighter atoms fuse into heavier atoms up to iron atoms. Creating elements heavier than iron through fusion uses more energy than it produces so stars do not ordinarily form any heavier elements. When there are no more elements for the star to fuse, the core succumbs to gravity and collapses, creating a violent explosion called a supernova. A supernova explosion contains so much energy that atoms can fuse together to produce heavier elements such as gold, silver, and uranium. A supernova can shine as brightly as an entire galaxy for a short time. All elements with an atomic number greater than that of lithium were created by nuclear fusion in stars. After a supernova explosion, the leftover material in the core is extremely dense. If the core is less than about four times the mass of the Sun, the star becomes a neutron star. A neutron star is made almost entirely of neutrons, relatively large particles that have no electrical charge. If the core remaining after a supernova is more than about five times the mass of the Sun, the core collapses into a black hole. Black holes are so dense that not even light can escape their gravity. With no light, a black hole cannot be observed directly. But a black hole can be identified by the effect that it has on objects around it, and by radiation that leaks out around its edges. The video below on the left demonstrates what it would be like to observe a supernova, while the other TED Talk is on hunting black holes. How can you measure the distance of an object that is too far away to measure? Now what if you don’t know the size of the object or the size or distance of any other objects like it? That would be very difficult, but that is the problem facing astronomers when they try to measure the distances to stars. Distances to stars that are relatively close to us can be measured using parallax. Parallax is an apparent shift in position that takes place when the position of the observer changes. To see an example of parallax, try holding your finger about 1 foot (30 cm) in front of your eyes. Now, while focusing on your finger, close one eye and then the other. Alternate back and forth between eyes, and pay attention to how your finger appears to move. The shift in position of your finger is an example of parallax. Now try moving your finger closer to your eyes, and repeat the experiment. Do you notice any difference? The closer your finger is to your eyes, the greater the position changes because of parallax. Astronomers use this same principle to measure the distance to stars. Instead of a finger, they focus on a star, and instead of switching back and forth between eyes, they switch between the biggest possible differences in observing position. To do this, an astronomer first looks at the star from one position and notes where the star is relative to more distant stars. Now where will the astronomer go to make an observation the greatest possible distance from the first observation? In six months, after Earth moves from one side of its orbit around the Sun to the other side, the astronomer looks at the star again. This time parallax causes the star to appear in a different position relative to more distant stars. From the size of this shift, astronomers can calculate the distance to the star. A good parallax exercise can be seen by clicking here. Even with the most precise instruments available, parallax is too small to measure the distance to stars that are more than a few hundred light years away. For these more distant stars, astronomers must use more indirect methods of determining distance. Most of these methods involve determining how bright the star they are looking at really is. For example, if the star has properties similar to the Sun, then it should be about as bright as the Sun. The astronomer compares the observed brightness to the expected brightness. Banner Image: Sombrero Galaxy (M104) from the Hubble Telescope.